My focus so far this Holy Week has been on the great gift of the Eucharist. 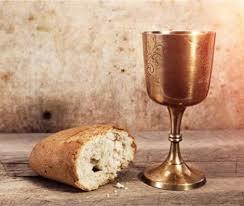 I am, of course, preparing for Holy Thursday, but my heart is so full of gratitude for the gift of God's presence with us in the Eucharist; we are able to receive Jesus who unites us to Himself, but also stays with us in the tabernacle. I think this Presence is so special and St. Madeleine Sophie thought so, too, and it is a grace to have the Blessed Sacrament in our communities. I think my love for the Eucharist has grown, but how often I am distracted after Holy Communion. What seems to help me is to say this little prayer that I have shared with you before but will do so again. We sing it often here. I am calm; I am smiling. You in me, I in You. It is a good prayer for any moment of the day or night! "Stay with us, for it is nearly evening..."
Easter Sunday, Alleluia, alleluia, alleluia! Say to everyone, "love me, I love you"